Eventually, the young woman interrupted Big Silver's soliloquy with a story of her own about scuba diving in Mexico. The young woman said that after she had been underwater for a while, she surfaced into a terrible storm. All the time she was swimming, she was anxious she wouldn't make it back to the boat, which was manned by a companion who should've been looking out for her. Big Silver responded to this tale by saying to the young woman: "You talk a lot don't you?" Levy, our erudite eavesdropper, keeps alluding to this story throughout her memoir. For her, it's as layered as that roiling sea. On a political level, the tale dramatizes what can happen when a woman claims the right to tell a story of her own. Also, Levy personally identifies with that young woman, frightened to be surfacing alone in a storm. When I was around fifty and my life was supposed to be slowing down, becoming more stable and predictable, life became faster, unstable, unpredictable. My marriage was the boat and I knew that if I swam back to it, I would drown. The Cost of Living is Levy's account of being tossed about in midlife. It's her work, including this memoir itself, made, as Levy writes, from "the cost of living" that becomes her rescue raft. Levy's style is fragmented, each anecdote as luminous, self-contained and hard as the pearls in the necklace she habitually wears around her throat. There's humor here and vulnerability; after all, in addition to her divorce, Levy has to weather those other common melancholy midlife markers — the death of her mother and the departure of one of her two daughters for college. But above all, The Cost of Living is a smart, slim meditation on womanhood informed by Levy's wide reading. Simone de Beauvoir, Emily Dickinson, James Baldwin, Virginia Woolf — they're just some of the Wise Ones Levy looks to for pointers about how a woman can be, once she has stepped out of her normative role or, as Levy puts it, once she is no longer "married to society." Here are a couple of Levy's pearl-like anecdotes: After the family home is sold, Levy and her daughters move to a vast old apartment house, whose mazelike corridors might have been transplanted straight out of Mr. Rochester's house in Jane Eyre. Levy herself, of course, is the resident madwoman in this attic. She describes her do-it-yourself effort to fix some blocked bathroom pipes one morning. Levy is dressed for the job in a black silk nightgown, a thick postman's jacket and fake fur boots. Even as she is busy excavating the muck of the pipes, Levy is contemplating the picture she makes, like some ancient shaman — dressed half female-half male — descending into darkness to find answers to life's mysteries ... or maybe just hairballs. Another pearl: Levy acquires an electric bike that she pedals between her apartment and the garden shed she rents as a writing space. It's a sign of autonomy and strength, but it's also wayward and heavy. As she is cycling home one rainy night, her grocery bag splits open, spilling, among other things, a volume of Freud, lipstick and a chicken all over the road, stopping traffic. Back home, Levy, her daughters, and their friends feast on that roasted run-over chicken as they laugh and talk. It's a brief moment of grace — until the next wave of the unexpected hits. "The best thing I ever did, was not swim back to the boat," Levy writes. "But where was I to go?" She doesn't have any clearer answer to that question by the end of this memoir than she did at the beginning. Oddly, Levy's stubborn uncertainty should reassure her readers that they are not alone in their own confusions; that there are, in fact, a lot of other bemused swimmers out there, not drowning but waving. This is FRESH AIR. Deborah Levy, who was born in South Africa and lives in London, is a playwright, poet and novelist who's known for her bold subjects and beautiful language. Two of Levy's novels, "Hot Milk" and "Swimming Home," were finalists for the Man Booker Prize. Levy has a new memoir, called, "The Cost Of Living," and book critic Maureen Corrigan says it will only strengthen Levy's reputation and name recognition in this country. Here's her review. MAUREEN CORRIGAN, BYLINE: Deborah Levy opens her new memoir, "The Cost Of Living," by telling us one of those small stories whose size, like an ant or a virus, stands in inverse proportion to its power. As Levy recalls, one night, she was sitting alone in a bar in the Caribbean. Near her, a muscled, middle-aged guy whose silver hair is gathered into a man bun starts chatting up a young woman. Levy comes to refer to him as Big Silver. Eventually, the young woman interrupts Big Silver's soliloquy with a story of her own about scuba diving in Mexico. The young woman says that after she'd been underwater for a while, she surfaced into a terrible storm. All the time she was swimming, she was anxious she wouldn't make it back to the boat, manned by a companion who should have been looking out for her. Big Silver responds to this tale by saying to the young woman, you talk a lot, don't you? Levy, our erudite eavesdropper, keeps alluding to this story throughout her memoir. For her, it's as layered as that roiling sea. On a political level, the tale dramatizes what can happen when a woman claims the right to tell a story of her own. Also, Levy personally identifies with that young woman, frightened to be surfacing alone in a storm. In Levy's case, the storm was the breakup of her long marriage. But that boat metaphor doesn't quite go in the direction you might expect. Listen to what Levy does with it. When I was around 50, Levy says, and my life was supposed to be slowing down, becoming more stable and predictable, life became faster, unstable, unpredictable. My marriage was the boat, and I knew that if I swam back to it, I would drown. "The Cost Of Living" is Levy's account of being tossed about in midlife. It's her work, including this memoir itself, made, as Levy says, from the cost of living that becomes her rescue raft. Levy's style is fragmented, each anecdote as luminous, self-contained and hard as the pearls in the necklace she habitually wears around her throat. There's humor here and vulnerability. After all, in addition to her divorce, Levy has to weather those other common melancholy midlife markers - the death of her mother and the departure of one of her two daughters for college. But above all, "The Cost Of Living" is a smart, slim meditation on womanhood informed by Levy's wide reading. Simone de Beauvoir, Emily Dickinson, James Baldwin, Virginia Woolf - they're just some of the wise ones Levy looks to for pointers about how a woman can be once she's stepped out of her normative role or - as Levy puts it - once she's no longer married to society. Here are a couple of Levy's pearl-like anecdotes. After the family home is sold, Levy and her daughters move to a vast, old apartment house whose maze-like corridors might have been transplanted straight out of Mr. Rochester's house in "Jane Eyre." Levy herself, of course, is the resident madwoman in this attic. She describes her do-it-yourself effort one morning to fix some blocked bathroom pipes. Levy is dressed for the job in a black silk nightgown, a thick postman's jacket and fake fur boots. Even as she's busy excavating the muck of the pipes, Levy is contemplating the picture she makes, like some ancient shaman - dressed half-female, half-male - descending into darkness to find answers to life's mysteries or maybe just hairballs. Another pearl - Levy acquires an electric bike that she pedals between her apartment and the garden shed she rents as a writing space. It's a sign of autonomy and strength, but it's also wayward and heavy. As she's cycling home one rainy night, her grocery bag splits open, spilling - among other things - a volume of Freud, lipstick and a chicken all over the road, stopping traffic. Back home, Levy, her daughters and their friends feast on that roasted, run-over chicken as they laugh and talk. It's a brief moment of grace until the next wave of the unexpected hits. The best thing I ever did, Levy tells us, was not swim back to the boat. But where was I to go? Levy doesn't have any clearer answer to that question by the end of this memoir than she did at the beginning. Oddly, Levy's stubborn uncertainty should reassure her readers that they're not alone in their own confusions - that there are, in fact, a lot of other bemuse swimmers out there not drowning but waving. GROSS: Maureen Corrigan teaches literature at Georgetown University. 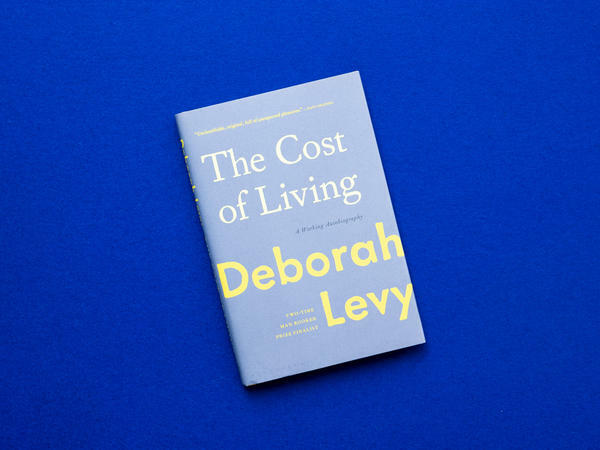 She reviewed "The Cost Of Living" by Deborah Levy. Tomorrow on FRESH AIR for the July Fourth holiday, we go deep in our archive for some great American roots music. We'll listen back to a 1988 interview with the revered folk and bluegrass guitarist and singer the late Doc Watson. And we'll hear his 1989 FRESH AIR concert. I hope you can join us, and I hope you have a great holiday. DOC WATSON: (Singing) Make me down a pallet on your floor. Make me down a pallet on your floor. Honey, won't you make it down? Make it soft and low. And then maybe my good gal - she won't know. I'm going up the country through that sleet and snow. Going up the country through that sleet and snow. Yes, I'm going up the country through that sleet and snow. Ain't no telling just how far I'll go. Get my breakfast here and my dinner in Tennessee. Get breakfast here and dinner in Tennessee. Going to get my breakfast here - my dinner in Tennessee. Told you I was coming, so you better look for me. Make me down a pallet on your floor. Make me down a pallet on your floor. Honey, won't you make it down? Make it soft and low. And then maybe my good gal - she won't know. What do you think about it, Jack? Yeah, I like that notion right there. Well, you know that I can't lay down on your bed. Now, honey, I can't lay down on your bed. No, baby, can't lay down - cross that pretty bed 'cause my good woman - she might kill me dead. And don't you let my good gal catch you here. Hey, don't you let my good gal catch you here. If you do, she may shoot you. She might cut and stab you, too. Ain't no telling what that gal might do. Make me down a pallet on your floor. Make me down a pallet on your floor. Honey, won't you make it down? Make it soft and low. And then maybe my good gal - she won't know. Transcript provided by NPR, Copyright NPR.